THE Villamont is the answer to a long time question. We often had requests to take one of our more popular plans and add a couple of feet into it. 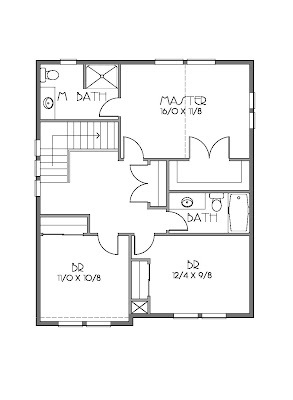 The Montavilla is a 25' wide plan that was developed for a specific purpose. But for most purposes 27' wide is even better. We figure it has a lot to do with 33' wide lots and 3' side setbacks. Whatever the case may be we are pleased to be able to diversify upon an original. Since this plan is distinctly different than our previous offerings we decided to give it it's own brand identity. Thus the name was reworked as a token of the original. As with the original, this plan is offered in both gable front and shed front varieties. Though we probably won't be developing any rowhouse combos. Unless you ask us to, of course. The covered front porch welcomes you into the living room. Only the faintest of features separates the living from the dining room. You could always flex the spaces to your liking. The kitchen includes a small eating bar for when you are only entertaining yourself. A door opens onto a small grilling porch, suitable for the Pacific Northwest. The powder room is tucked in the back corner of the house for privacy. From the garage, you have access to the crawl space and extra storage under the stairs. Upstairs are the customary three bedrooms and two bathrooms. The master bedroom is vaulted for openness. The closets are ample and a separate linen is included. 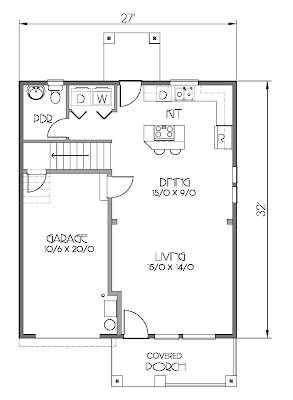 The loft area could be used as a small play area, a computer space, or as your laundry sorting center. (it's nice to see those pie stains before they go through the wash).